Lisa Coggins – The Guardian Foundation, Inc.
On March 20, 2019 you will have 24 hours to give where your heart is! Help support our cause and participate in this annual event! All donations provide for our children to help them feel normal through either day to day necessities or be able to participate in other activities other children would. We thank and appreciate any and all donations! Let’s make this a successful campaign! 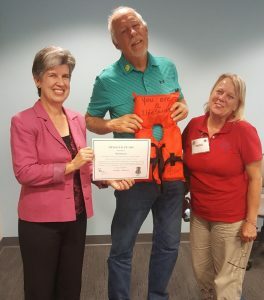 The Guardian ad Litem Program’s Circuit Director, Angela Armstrong and Training Facilitator, Irena Melvin presented Bill Stasiewicz with a Life Saver Award on August 14, 2017 as a thank you for saving the day for a recent volunteer event. Bill is a Volunteer with the Program and an Advisory Board Member of the Guardian Foundation. Our sincere thanks to Bill!